Copyright © 2017 Lumina Media, LLC, All rights Reserved. Does Your Rescue Dog Have an Eating Issue? Thanks to her new family and supporters, the German Shepherd got the care she needed to be healthy. The pictures showed every protruding rib, but still, Kristi Graham was not prepared for just how skinny the shelter dog she was adopting truly was. At 38 pounds, 2-year old Murphy weighed less than half of what a German Shepherd should. “I knew going into it that she was thin, but when I got there, I just bawled. I’d never seen a dog that malnourished,” says Graham. Graham — along with her husband and three young kids — had adopted another German Shepherd mix, Molly, about a year earlier. A special needs dog, one of Molly’s rear legs had been amputated before the adoption, but she quickly proved she didn’t need that extra leg to be the perfect family pup. As her adoption anniversary came and went, it became clear that what Molly really needed was a canine companion. “I had been considering it for awhile, and when I saw Murphy on Becky’s Facebook page, that’s who I was compelled to adopt for Molly’s companion,” Graham explains. Graham’s Facebook friend, Becky Switzer, is known for leading the University of Oklahoma gymnastics program to conference championships. She’s hailed as a pioneer in women’s sports in the state, but she’s also got a reputation as a dedicated dog lover. Switzer and her husband Barry (former University of Oklahoma and Dallas Cowboys football coach) have several German Shepherds at home, with some trained for search and rescue missions. 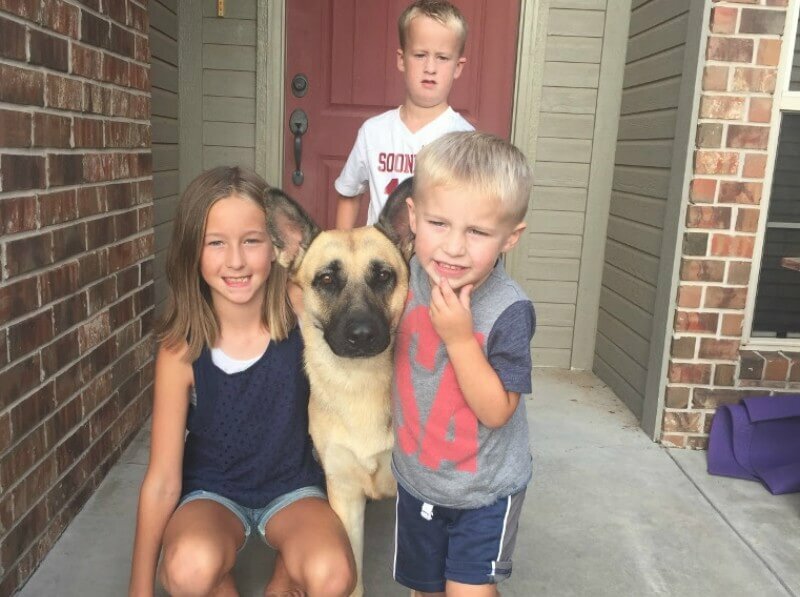 With their house full, the Switzers weren’t in a position to adopt Murphy themselves, but shared her story on social media when the Pets & People Humane Society in Yukon, Oklahoma, put out a call seeking a home for an extremely underweight German Shepherd. The organization was seeking to rescue Murphy from another shelter where she was likely to be euthanized. “I contacted Becky and said I was interested,” explains Graham, who soon found herself arriving at the Pets & People Humane Society with her two oldest children. Seeing the emaciated dog in person was overwhelming. Once at home, Murphy quickly bonded with Molly and the rest of the family. The Grahams fed her frequent, small meals in an effort to put weight back on her skeletal frame, but Murphy’s hunger seemed to be never ending, and she continued to suffer from diarrhea. After 10 days of eating well and being loved, Murphy suddenly collapsed in the backyard. “Her gums were pale, and she was just lethargic,” says Graham, who was at school the next day when she got bad news from her vet. Murphy needed a blood transfusion to save her life, and she needed to be transferred to the local emergency veterinary hospital, BluePearl, as soon as possible. “I couldn’t get off just yet, so she was Ubered from that vet to the emergency hospital to try to get her there quickly,” says Graham. At first, the school teacher worried about how she and her husband (a fellow teacher) would pay for Murphy’s treatments, but when the Switzers heard about Murphy’s deteriorating health, the well-known couple created a Go Fund Me account and shared it with their social media followers, many of whom donated to the cause. After her blood transfusion, Murphy remained at BluePearl for a week and a half. “She was diagnosed with the condition she has. It’s EPI … exocrine pancreatic insufficiency. Her body doesn’t have the enzymes that are needed to digest food. So everything she was taking in was not absorbed by her body, and that’s why she wasn’t able to get healthy once we had her,” Graham explains. Eventually Murphy came home with a new diet plan which includes easy-to-digest food and powdered enzymes. “We sprinkle that on her food, and then it has to sit for about 30 to 40 minutes, and then she’s able to eat it,” says Graham. Now getting the nutrients she needs, Murphy has more than doubled in size, now weighing in at more than 80 pounds. The lucky dog spends her days playing with Molly and reflecting back all the love that helped her transform from underweight to unstoppable in just a few short months. “She’s just the most lovable thing you’ve ever met,” says Graham. Heather is a wife, new mom, and former TV journalist in Alberta, Canada. Her beloved Ghost Cat was once her only animal, but the addition of a second cat, Specter, and the dog duo of GhostBuster and Marshmallow make her fur family complete. You can follow Heather on Twitter and Google+. Tip: Creating a profile and avatar takes just a minute and is a great way to participate in Lucky Puppy community of people who are passionate about animals. Does Your New Dog Guard Food and Toys? Copyright © Lumina Media, LLC. All rights reserved.